What is the trick to a good paella? Persistence. Other techniques come in handy and we will revisit them here periodically. I have many Spanish friends who taught me their own tricks for the proper paella. Some work and others do not. In any case I’ll roll my eyes in advance at some of our Spanish readers’ pronouncement that this is not paella, but the pejorative arroz con cosas – rice with things. You mean things like saffron, garlic, onions, seafood, chorizo? You see, a friend from Valencia – the apparent birthplace of paella – insisted that it is not paella if it is not made with Valencian rice and Valencian water. Her paella was exquisite, but then again she cooked it at her apartment in San Francisco. 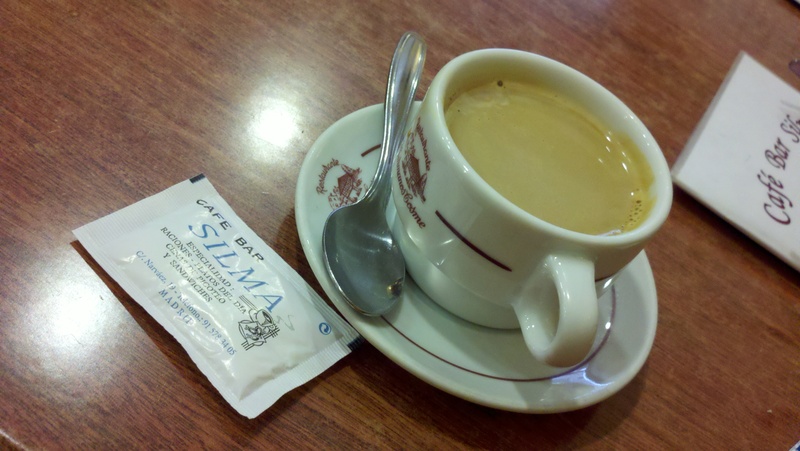 Another friend, this one from Madrid, never measured ingredients but rather he just threw stuff in. Part of its greatness came from the fact that he cooked it, according to tradition, over coals. 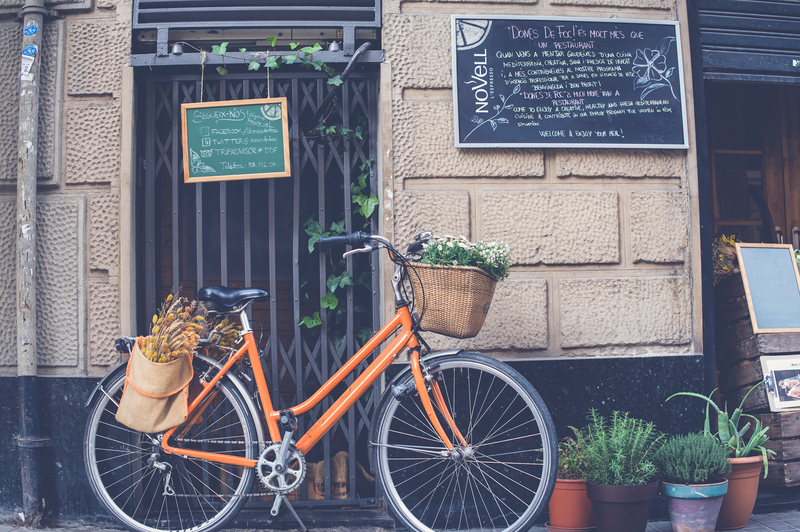 Regionalism matters anywhere there is good food, which is pretty much everywhere in Spain. While I have no luck getting water from Valencia, I can get Valencian rice from La Española in Lomita. 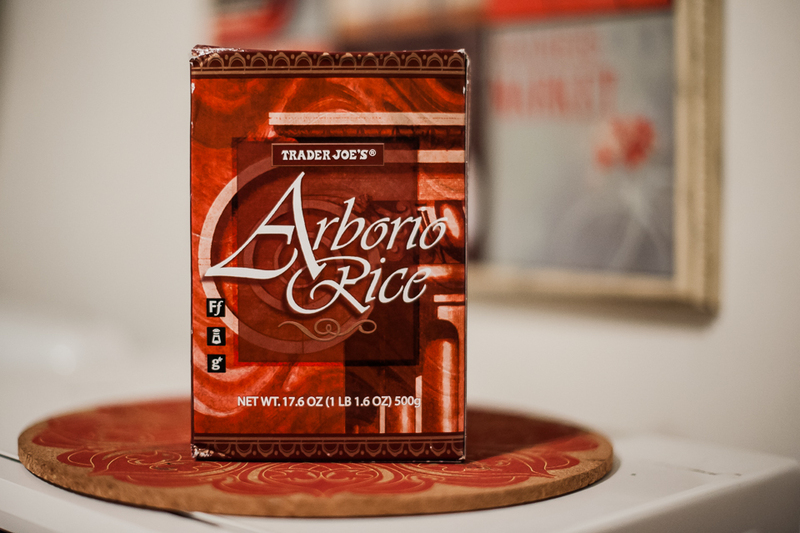 This time however I made do with a box of Arborio rice from Trader Joes. Don’t have Arborio either, you say? Then use whatever you have in your cupboard. Just not Uncle Bens – even my impatience for food snobbery has its limits. Spain’s national dish, paella, was born in Valencia, in eastern Spain on the Mediterranean. This is a region in a country whose seventeen “autonomous communities” tend to identify themselves more with their own region than with the country. A number of them – including Valencia – have their own language. Some would just as soon break away and leave Spain entirely. Catalonia – the Catalán-speaking region whose capital is Barcelona – is forever balancing the desire to break away from Spain. As a Madrid-based college student visiting Barcelona for a weekend, I saw the confusing graffiti in Catalán: “Catalunya no és Espanya”. Catalonia is not Spain. 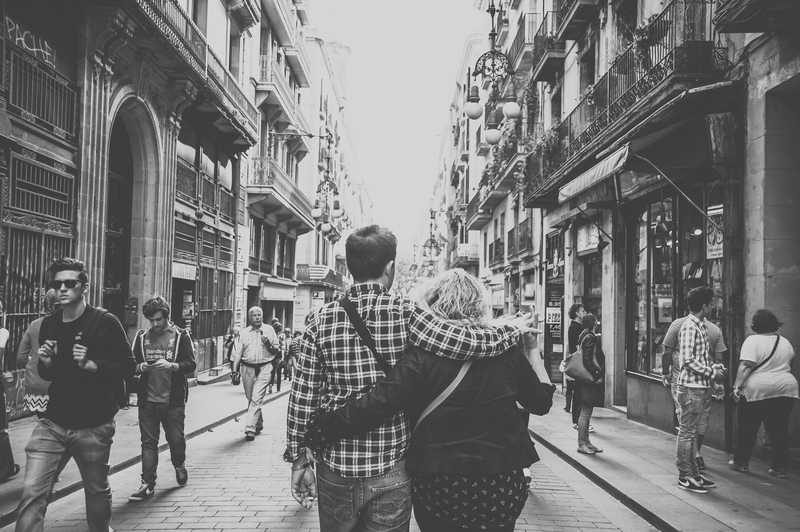 Language, culture, control, and destiny all clash, and not just in Spain. Civil war in Ukraine and an upcoming vote for independence in Scotland tell similar stories. And then there is Valencia. A few years ago, okay, twenty-five years ago, I sat on a train between Madrid and Barcelona. I listened a conversation between a few men from Madrid and a woman from Valencia. What was your opinion, they asked her: Was Valencian a dialect of Catalán or its own language? “Absolutely a language, without a doubt,” she said, her voice rising as fast as her blood pressure. He feet were planted firmly into the train car’s floor, like her unbending view of the prominence of the valencià language in her world, in paella’s world. In the region of Mediterranean Spain between Valencia and Barcelona, Catalan nationalists call it “Països Catalans”, the Catalan countries. Some Valencian homelanders might view that with suspicion: Catalan imperialism, they call it without a hint of irony as both rail against Spanish imperialism and centralized government from Madrid. Paella, Spain’s “national” dish that was born in Valencia, raises passionate arguments about not just what ingredients to put in it, but whose water. The passions are not so different from one’s own regional identity. What is my country called? What language do I get to speak? What language should I expect others to speak as well? Painful choices. And if you choose wrong? Well then, someone out there is ready to pronounce that you are just eating arroz con cosas. Back to our paella. I have Charla’s trusty cast iron pan. If you don’t have a cast iron pan, get a paellera. More on that name later. Or any 14-16 inch pan. Next step: pour a glass of wine. It doesn’t have to be Spanish. Heck, it doesn’t have to be red, just pour a – one – glass. Why? Because wine goes so well with Mediterranean food. Because you are celebrating this particular moment in life, that you have a chance to create goodness and nurture those you care for the most, even if it’s just yourself. If you don’t drink, then have anything: water, lemonade, ice tea, juice. Sauté diced onions and garlic until toasty with a nutty aroma. Add sliced chorizo. 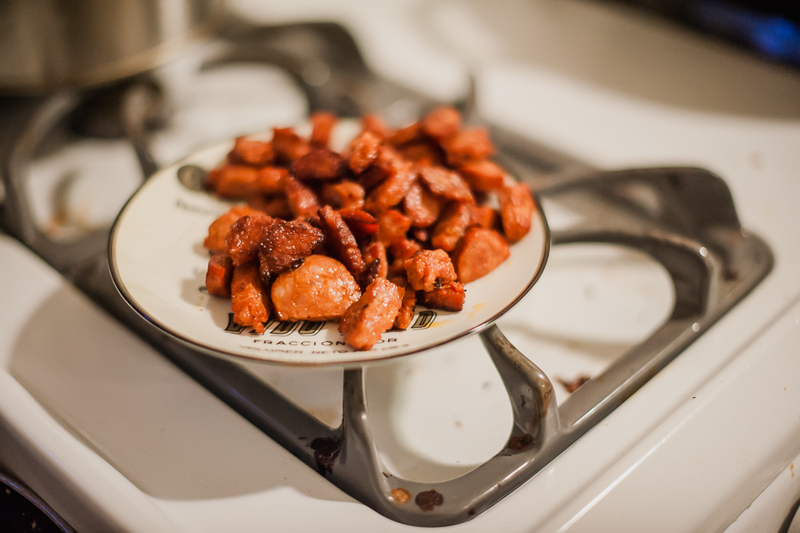 In this case I used my reliable standby Longaniza, a fully-cooked sausage from Vons or Ralphs. 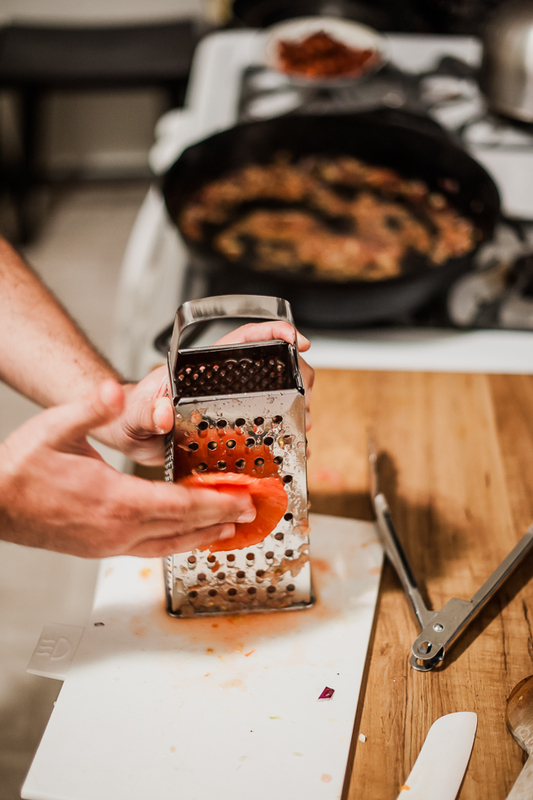 Then fresh tomatoes – chopped, diced or puréed. There are endless varieties of paella, and once you stop worrying making arroz con cosas by mistake, you can do quite a bit and adhere to its basic spirit. 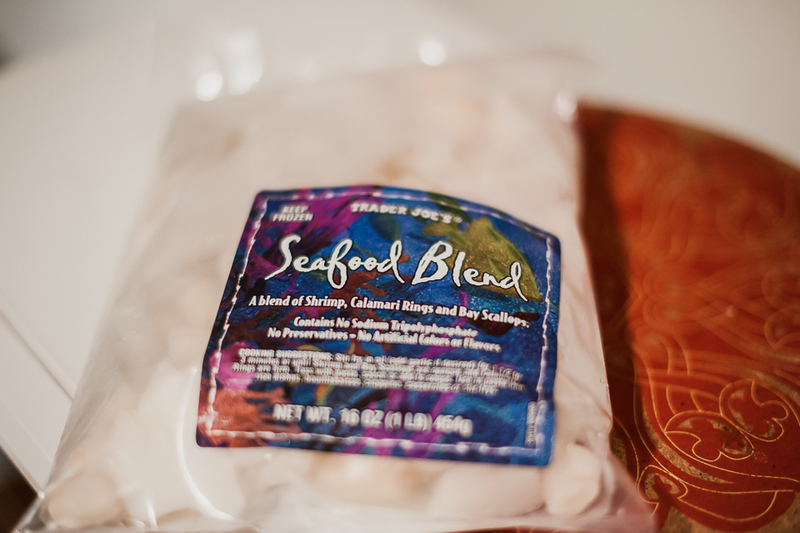 This time I added a Trader Joes frozen seafood mix: scallops, shrimp and calamari. After that gets going, add half a cup of cheap white wine. The wine should be so cheap it will dry your eyeballs out. Don’t cook with good wine, because all its amazing goodness will be cooked right out of it. Add half teaspoon of smoked paprika. 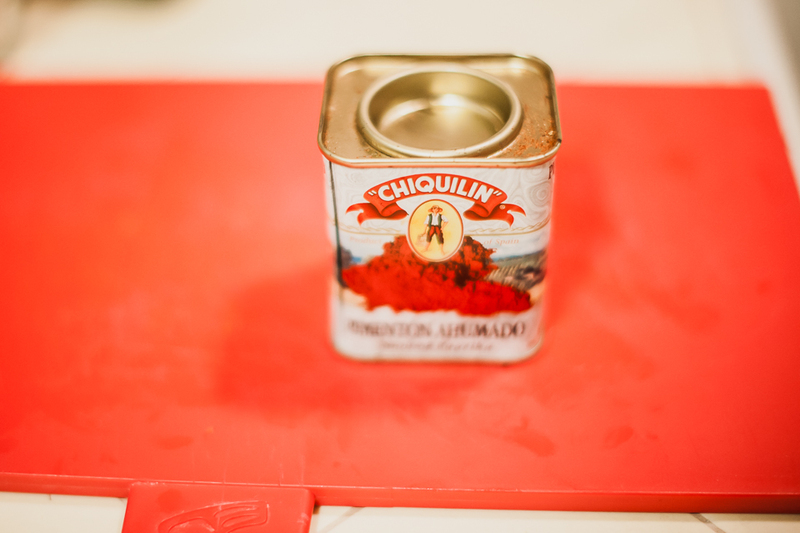 This stuff is not be easy to get, so go again to La Española or order it online. Or just skip it; you’ll still have a fine paella. Add saffron. Don’t be shy – if you use those tiny bottles from Trader Joes, then just dump the whole thing in. We are gathering a good collection of these empty bottles, like they were memories of paellas past. Finally, the rice. For my 16-inch pan, I use one cup. 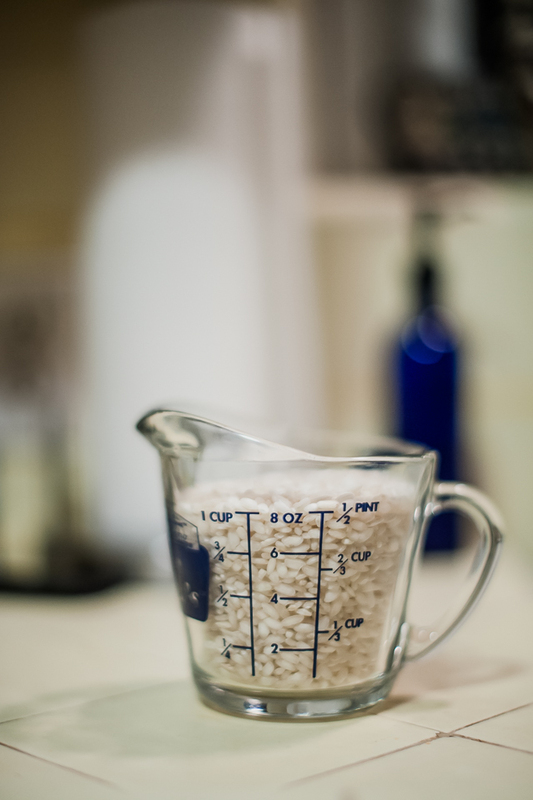 Rice doubles in volume when cooked, so normally we cook any quantity of rice in twice the amount of water. However, we are cooking this paella uncovered which means that too much of that water will evaporate, leaving you with undercooked, gummy rice. This is not a good thing. Remember what we said about persistence? Many years of repeatedly undercooking rice taught me to add triple the amount of water. So once your rice is well stirred in the pan, about 3 minutes, then add three cups of water and bring to a boil. The rice fully cooks in 20-30 minutes. 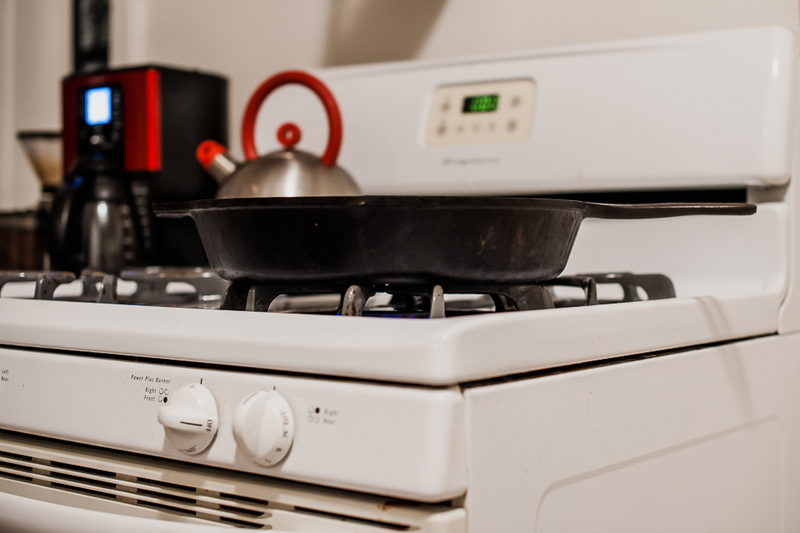 Every 5 minutes, lower the temperature on the stove a bit that by the time 25 minutes have passed, the stove is almost at the lowest setting. 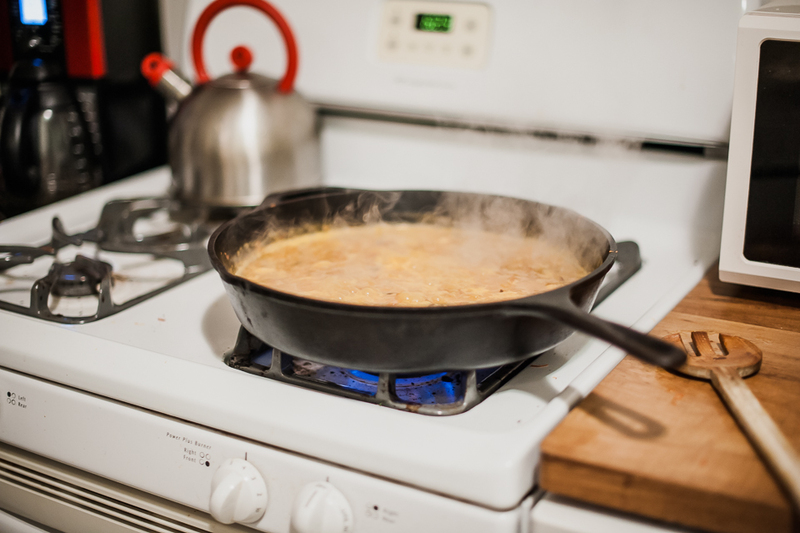 If you have a thin bottom pan then rotate it periodically around the stove so that different areas receive direct heat. 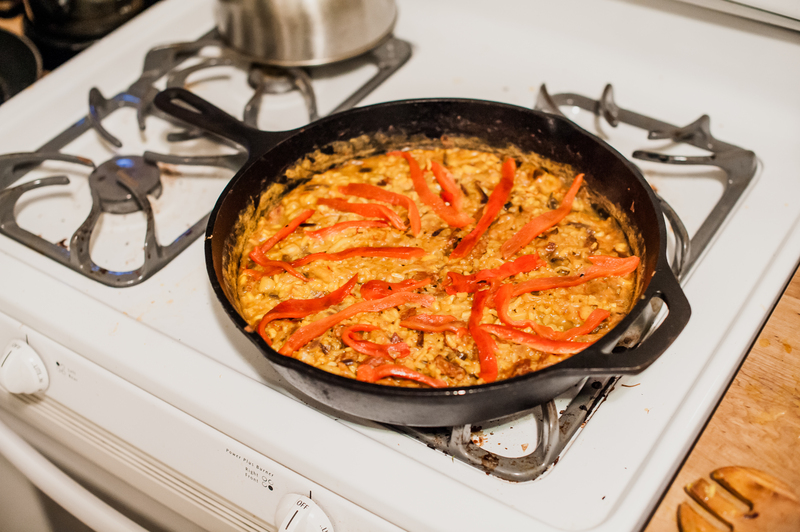 Let the paella sit off heat for a few minutes while you badger your guests to sit down. Cut a lemon into 6-8 slices and insert them around the edges. Decorate the top with strips of roasted sweet red pepper. Serve the whole pan at the table. Enjoy! And be sure to ask your friends whether their own way of speaking their native tongue is a dialect or its own language. Some measurements are approximate. Do yourself a favor and test it a few times before you offer it to guests. Serves 4-6 if accompanied with other food, or 2-3 if served alone. If cooking chicken, saute chicken pieces in oil over medium heat. Pieces will stick to pan; keep heat moderate so that chicken does not burn. Be supremely patient and test the chicken with tongs. It should eventually release from the pan slowly on its own. When almost cooked, about 20 minutes, remove to a side dish. If the pan has darkened chicken drippings, then pour half a cup of white wine and scrape with a wooden spatula. Save the remaining juices for the paella. 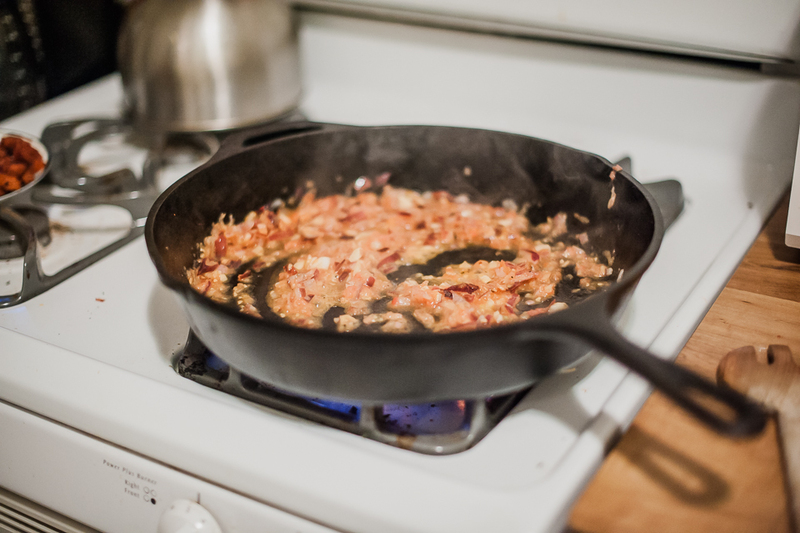 Saute onions and garlic in same pan over moderate heat. After 5 minutes, add chorizo. After 5 more minutes, add tomato. After 5 more minutes, add shellfish. If shellfish is frozen, there is no need to defrost it. Add half cup of white wine and bring to a simmer. Add smoked paprika and dissolve in the liquid; add saffron threads. If using saffron powder, add similar amount and stir to dissolve. When liquid in pan reduces by half, add rice, spreading evenly around the pan. 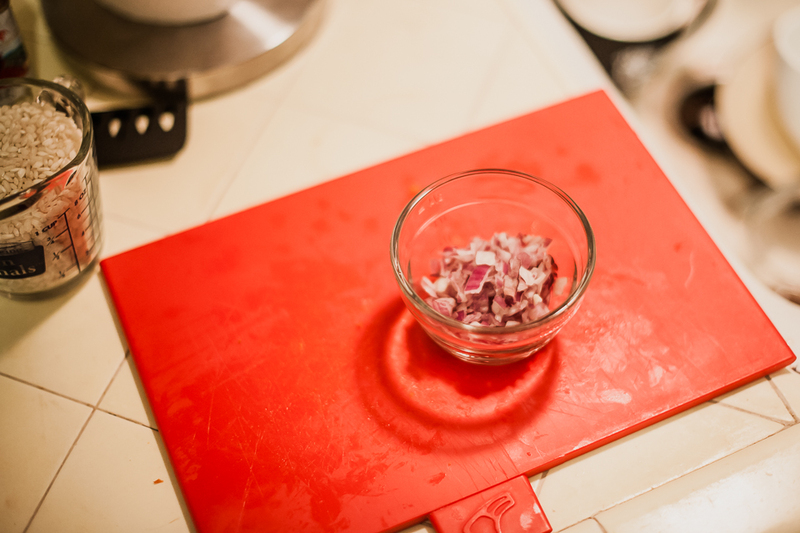 Add chicken pieces, if using, and any reserved juices. Add water and bring to a rapid boil. For the first 10 minutes, stir occasionally to ensure that rice remains submerged. 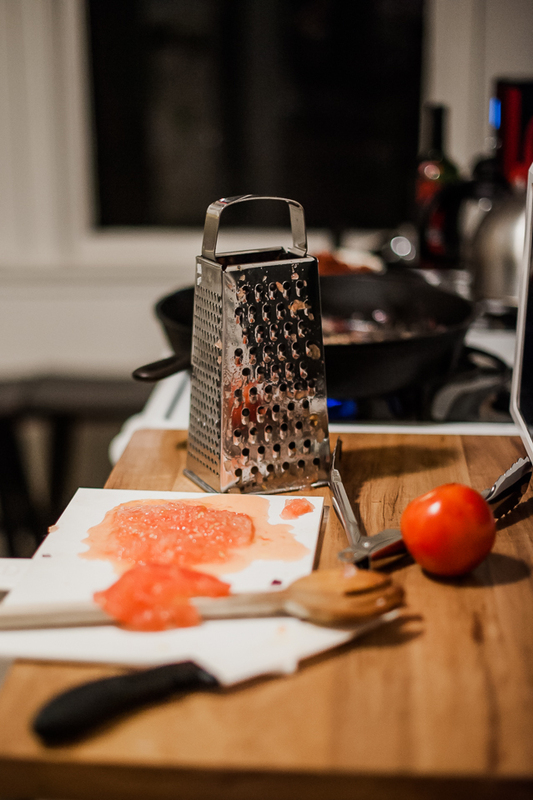 Every five minutes, reduce slightly the heat on the stove, until after 25 minutes it is on the lowest setting. Off heat, add 6-8 slices of lemon. Let rest for a few minutes, add salt if needed.